Various embodiments of a pneumatically powered cue stick are disclosed. Both embodiments employ the use of compressed gas to derive the full range of power necessary to engage in the various games of pool and billiards, including the break shot, without the need for modification of surface area of the game table. The preferred embodiment is adaptable to existing forms of metering, triggering, portable compressed gas dispensing devices such as, but not limited to, paintball marker guns. An alternative embodiment integrates the metering, triggering, and gas dispensing components of the adaptable type, eliminating the need for the separate, adaptable devices previously mentioned. Both embodiments incorporate a cylinder assembly 14 and a cue stick rod 12 threadably, or otherwise attached, slidably mounted within a support casement 10, to facilitate a predetermined length not unlike, but not limited to, that of a conventional cue stick. Both embodiments are suitable for one-handed operation. This patent is strong in it's claims. It also comprises two unique embodiment's in the same patent. The second embodiment is waiting for further development and promises for wide spread market acceptance. The billiard market, world wide, is better than 300,000,000. One half of one percent of that market is 1.5 million. I have done manufacturing and realized the 1 to 5 ratio required to turn a profit. 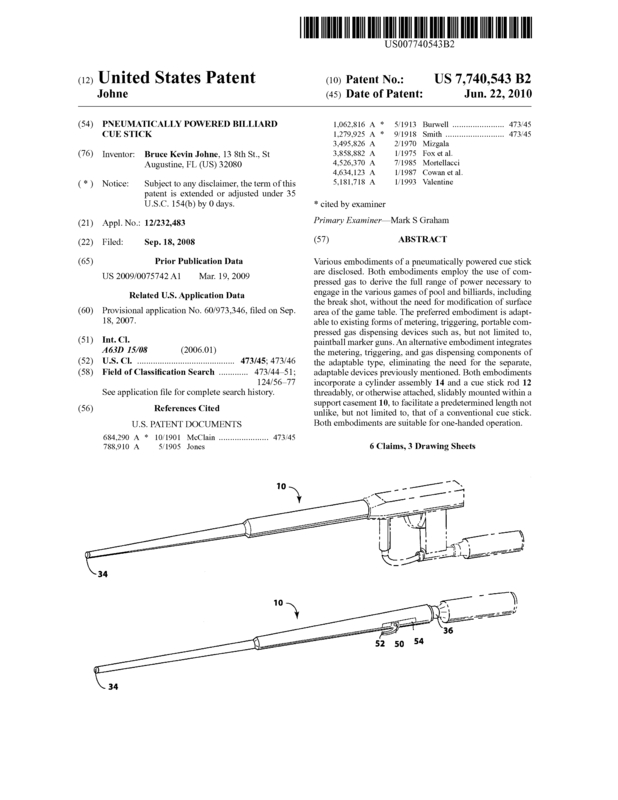 Page created at 2019-04-24 23:58:49, Patent Auction Time.